Erythrina crista galli or ‘Cockscomb Coral Tree’ is the best known of this genus of sub tropical flowering trees. Erythrinas are originally from areas such as South Africa, Argentina, Uruguay, Brazil and Paraguay and Christa Galli is the national flower of Argentina. Erythrina can grow up to 30m but some species such as the deciduous Erythrina crista-galli are often pollarded to a few shortened branches to keep them more manageable. In cooler climates this is a tree that when in full flower creates a vibrant tropical look in larger gardens. This is actually a better tree in cooler climates, in sub tropical areas it can tend to self seed, especially if planted along waterways. 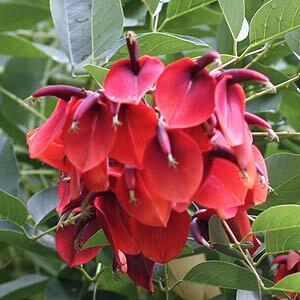 Although seen as a sub tropical tree Erythrina species can be successfully grown in temperate climates. The botanical gardens in Melbourne (Australia) has several fine specimens. In these gardens Erythrina crista galli, ‘Cockspur Coral Tree’ or ‘Cockscomb Coral Tree’ is pollarded successfully and these trees provide a fine show of coral red flowers during early to mid summer. Erythrina vespertilio or ‘Bats-wing Coral Tree’ . Erythrina x sykesii – all species worth investigating.